Benton County applied for funds to build the trail to this point at Scenic Drive and Highway 20. Good news on the cycling front — I think. The long-planned Corvallis-Albany bike trail may soon get $2 million of the roughly $4.8 million it is estimated to cost. The project ended up 18th on a statewide priority list of funding under the program known as Connect Oregon V (that’s V as in 5). Local governments and others asked for grants totaling more than $124 million for “multimodal” transportation projects under the fifth installment of this lottery-funded program, and $42 million are available. After the initial rounds of reviews by local groups around the state, the final review committee reached its recommendations in Portland Wednesday. Benton County had asked for $4.8 million, and the review committee recommended that $2 million be approved. The project also calls for $1.2 million in matching contributions, but exactly where that would come from was not clear. Some of it could take the form of staff time spent by public works employees. 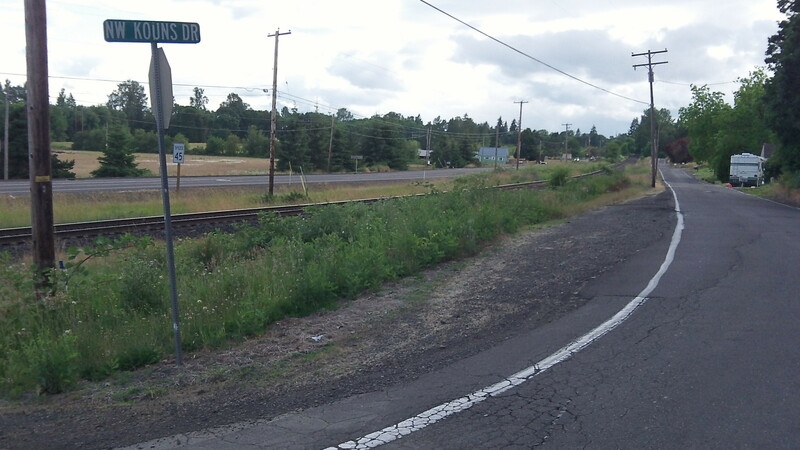 The trail would run roughly alongside the railroad right of way between Corvallis and Albany. It’s intended mainly to allow bicyclists to travel between the cities without risking their lives on the shoulders of the Albany-Corvallis Highway. A short section of the trail has been built in Corvallis. Benton County applied for the Connect Oregon funds to build the roughly six miles from Manchester Street in northeast Corvallis to Scenic Drive in North Albany. The review committee recommended that portions of 37 transportation projects in all parts of Oregon be funded in this round for a total of $42.4 million. The $2 million for the trail is No. 18 on the list. No other projects in Linn or Benton County were recommended for funding. Final approval is up to the Oregon Transportation Commission, which will hold a public hearing July 17 in Salem and take action when it meets in Ontario on Aug. 21 and 22. Thanks for keeping after this one. As I often bike commute on Hwy 20, it is of great interest. The trail would get a lot more folks on that route, for business and pleasure. I have no problem with the building of a bike trail. I do have a problem with using funds that result from governmental taxing power. Bikers who choose to use the trail and receive its benefit should pay a user fee. Non-bikers shouldn’t be forced to subsidize a biker’s choice. Thanks for the clarification on lottery bonds. While use of lottery money is a target rich environment, I will leave it alone. But lottery money only covers $2M of the $4.8M est cost. $1.2M must come from matching funds, i.e., sources undefined and TBD. $1.6M is not even addressed. Any guesses on where the remaining $3.8M will come from? The general funds of the multiple governing bodies like Albany, Corvallis, and Benton County? Sorry, $2.8M, not $3.8M. It’s late in the day….